What if everyday when you woke up you had the appearance of a completely different person on the outside? That’s the basic—and very cool, we think—premise of The Beauty Inside. The movie tells the story of Alex, who maintains the memories and mentality of a 20-something male as he goes through a daily metamorphosis of his appearance. He’ll look like an Asian grandmother one day, a middle-aged balding man the next and so on. Throughout it all, Alex has to keep a job, maintain his friendships and perhaps, per chance, find love. First, the movie will be released online in weekly installments. The first episode is scheduled to air August 16th on The Beauty Inside‘s Facebook page (where fans can also interact with Alex). Second, The Beauty Inside goes beyond mere product placement. The whole movie is sponsored by a single product: the Toshiba Portege Ultrabook. 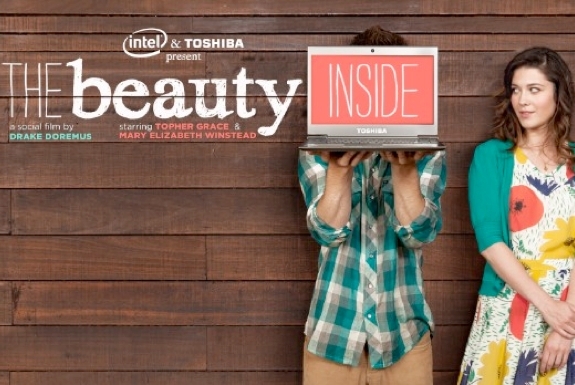 (Toshiba, along with their ultrabook partner Intel, also sponsored the Spot Cool Stuff post you currently are reading). And if you were wondering what the tie-in is with the movie, Alex uses a Portege to keep his daily journal. This post is sponsored by Intel & Toshiba.